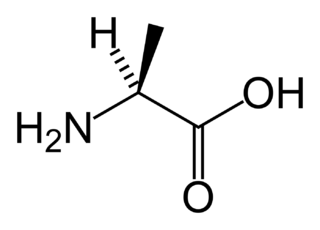 Why would this be "L-cysteine"? This is taken from the answer key for my biochem final. From what I understand if the -NH3(+) is on the left then the alpha-amino acid is in the L-configuration. Am I wrong, or is my prof wrong? What makes your image confusing is that it's a Fischer Projection, and I hate those because you have to remember what way the stereochemistry goes. In Fischer Projections, vertical lines face away from you, while horizontal lines face towards you. So if we convert the L-alanine I provided to a Fischer Projection, first we have to rotate the alpha carbon to put the methyl side chain in line with the rest of the carbon backbone. Now we look at the alpha carbon with the NH2 and H looking at us to create the Fischer projection. Here, the amine is on the left, not the right. You drew the amine on the right, which would give you the opposite orientation. If your professor had the amine on the right, I think he was wrong. Additionally, the D vs L nomenclature is confusing. I prefer the S vs R nomenclature because that's what I was taught for molecules in general. Most amino acids fall into the S configuration, but cysteine is an R, because the sulfur atom has higher priority. However, cysteine is still an L, and the amine would still appear on the left in the Fischer Projection. This is why biologists stick to D and L for amino acids.